The White House is again threatening executive action if lawmakers can't reach a deal on border security over the next three weeks. 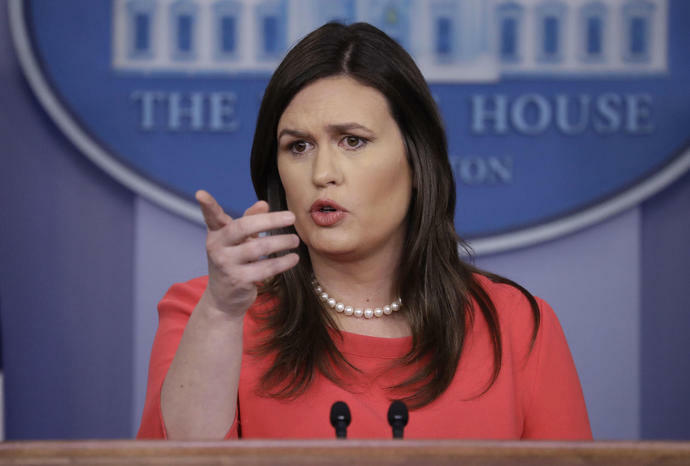 White House press secretary Sarah Sanders told reporters Monday at her first White House briefing of the year that if Congress can't come to a deal that President Donald Trump supports, then that will "force him to take executive action." She says, "If Congress doesn't do their job, then the president will be forced to make up for all their shortcomings." Trump has repeatedly threatened to sign a national emergency declaration bypassing Congress to try to secure money to build his long-promised border wall. That move would surely be challenged in court. Sanders also tells reporters that the White House doesn't want to see another government shutdown when temporary funding runs out in three weeks, but she says that is up to lawmakers. President Donald Trump says the odds that congressional negotiators will craft a deal to end his border wall standoff with Congress are "less than 50-50." Trump tells The Wall Street Journal that he doesn't think the negotiators will strike a deal that he'd accept. He pledges to build a wall anyway using his executive powers to declare a national emergency if necessary. A bipartisan committee of House and Senate lawmakers are expected to consider border spending as part of the legislative process to keep the government open past a Feb. 15 deadline for a budget agreement. Hundreds of thousands of furloughed federal workers prepared to return to work now that the 35-day shutdown is over.